Out of This World is a clone of the 1986 game Trailblazer. It features very fast, 50 frames per second action. 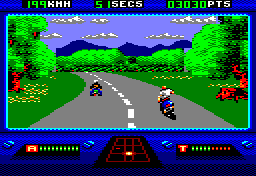 To begin with, this game has amazingly smooth and fast vertical scrolling – something that I've rarely seen on the CPC. The graphics are nice, just like they used to be on the original game, and there is also a nice tune. The gameplay is very demanding but the accurate controls and collision detection will be really appreciated. The grab factor is strong but the difficulty can be frustrating. You can decelerate and accelerate, but your reflexes will still be tested to their limits! Overall, a great and challenging game. The new RP2-16 spacecraft is capable of approaching the speed of light. While testing it, you suddenly enter another world, full of aliens and strange landscapes. The game is a straightforward space shoot-'em-up with eight levels, and all you can do is blast aliens and collect coins that allow you to upgrade your weapon temporarily. When you've shot enough aliens, an icon appears on the screen which takes you to a bonus sub-level, which you must survive in order to go to the next level. It's not at all easy, especially since waves of aliens often appear right on top of your ship and cost you a life, and even worse, the backgrounds are so brightly coloured that by the third level, it's impossible to see what's going on! Nice graphics but not so nice gameplay. This game is well known for being one of the worst coin-op conversions to be seen; it really is terrible. You're racing in your Ferrari with some beautiful girl in the passenger seat and have to get to the next checkpoint within the time limit, while dodging the traffic, which gets heavier as you go further. 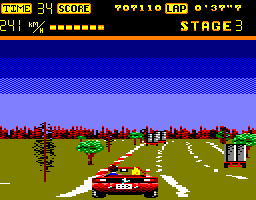 At the end of each stage, the road branches in two, and with five stages, there are lots of routes to take. This variety doesn't excuse the fact that the graphics are average and the only sound to be heard is the screeching of your tyres when going round the corner. In fact, you're supposed to listen to the audio tape provided while playing the game – what cheek! It's really slow as well. 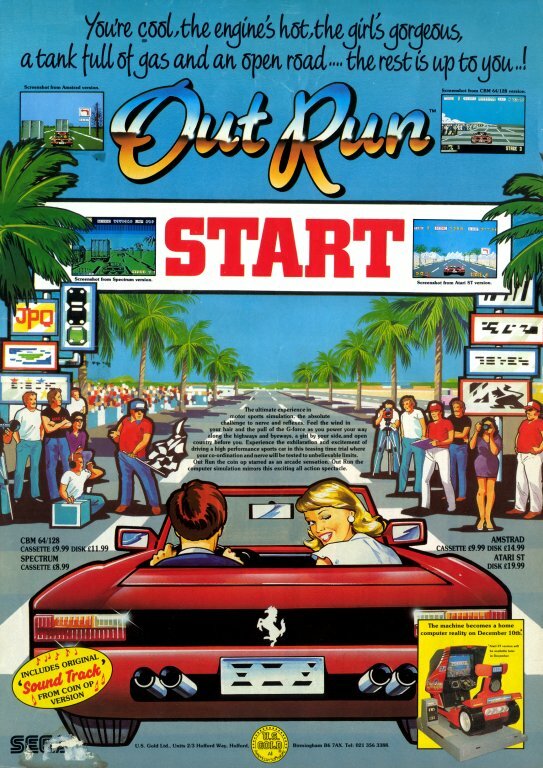 See also: Out Run Europa, Turbo Outrun. Watch YouTube videos of this game by: ChinnyVision, GameHammer Classic Gaming, Xyphoe, ZEUSDAZ. Terrorists have stolen some top secret documents which you need to deliver to Berlin. The chase starts in England and takes in France, Spain and Italy as well. Why do the terrorists not take a much shorter route? 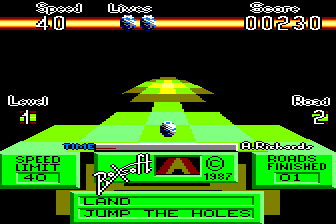 Anyway, the game consists of seven very long levels, and as with the other two games in the series, you must reach the end of each level within the time limit. 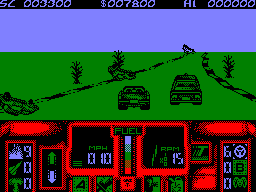 The graphics are excellent, and the game is particularly noteworthy for the remarkable amount of scenery which lines the roads – yet despite this, it's still very fast indeed. Unfortunately it's not much fun to play. Extra ammunition and turbos appear on the road occasionally, but it's difficult to collect them. Also, if the police catch you, or you run out of time, you must go all the way back to the start of the level, which really spoils the gameplay. 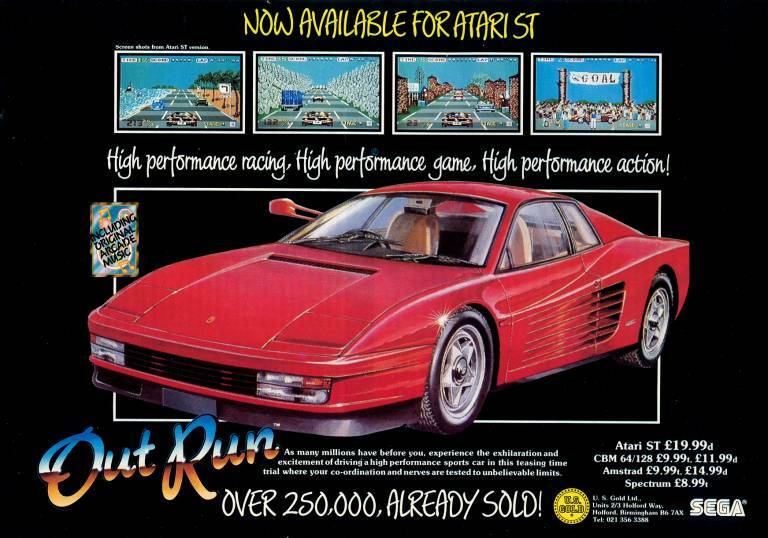 See also: Out Run, Turbo Outrun. Overkoban was an entrant in CPCWiki's 16KB ROM game development competition held in 2013. The game begins with an amazing tune. Personally speaking, this is one of the best CPC tunes ever. The game has 50 levels and it is a brilliant puzzle game. The player needs to move the boxes to the correct positions to progress to the next level. The graphics are good and colourful but there is almost no in-game sound. Nevertheless, the music is simply amazing. The gameplay is great; the levels are very well designed and the difficulty level rises progressively. The grab factor is stronger than the grab of a wrestler! Overall, any CPC gamer needs to have at least one look at this terrific game. These are the fullest 16 kilobytes of mind-bending action you will ever experience! The world has been devastated, the ozone layer disappeared long ago and so people have to live in isolated underground cities. Only the overlanders dare to face the perils of the outside world, delivering cargo between cities in their heavily armed cars. That is, for a price. Needless to say that the money earned for each delivery will allow you to buy better weapons and improvements for your car. 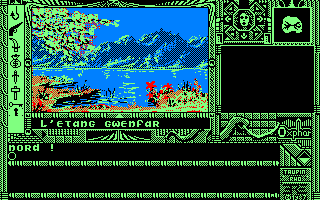 Regarding graphics and sound, Overlander is quite an average game, almost a Spectrum conversion. Nevertheless, the gameplay makes it an interesting game, with a Mad Max touch that the player will enjoy, at least for a while. You have been transported from Earth to the land of Do. Your name is now Oxphar and your quest is to find the blue stone of Savanah. Do is a surreal land of fantasy in which you will meet many different kinds of characters, both human and non-human. At the start of the game, you are carrying nothing, but picking up a bank card will allow you to access the armoury. Objects can be taken from it and used appropriately, but this is where this French adventure game disappoints. It's not at all obvious what the objects are; you can't examine them, or your surroundings, and you can't talk to any of the characters. Most players will have considerable difficulty in working out the use of the large majority of the objects. The pictures accompanying each location are astoundingly beautiful and well drawn, but they're wasted on a mediocre game such as this one.